will fix the issues and make the spectre a bit more visible. Actually none of the reported issues have been addressed, despite removing the barrel model from the package. The animation of the Spider Mastermind's legs looks really good, way better than the sprite. But the Spider Mastemind appears to squint, the pupils are too close to the center which destroys the immersion for me, because the Spider Mastermind appears to make a funny face or has gone plain mental. The sizing of the model, especially its height, appears not quite right yet. I agree with deus ex that the eyes look like they are looking in an odd direction and that the over all model looks a bit small. I also think the super chaingun muzzle flair looks a bit small. I have submitted all issues now. While on it I took the liberty to add Vermil's complaints and suggestions regarding the Pinky and SpiderMastermind. I think that's in everybody's interest. I have to apologize, actually some issues were fixed which I only noticed later on on closer inspection (reflections.pack). To compensate, I found and reported some new issues. Regarding the rocket.pack, the previously described issue (model too small) has completely changed to the opposite, probably due to the recent changes to the perspective matrix in Doomsday. I added screenshots to the reported issues were appropriate. Thank you for taking the time to make the pack better guys. You are welcome. Thank you and Tea Monster for creating the pack in the first place. To echo Tea Monster's comment, thank you for the effort - it's very much appreciated. 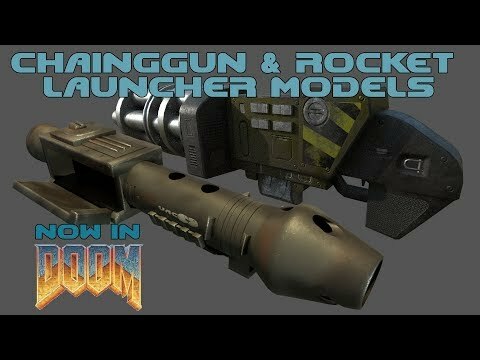 Question: HUD model for chaingun / rocket lauchner didn't show up, only the their pickups. I' using rev 2900. Any idea? Simply because the HUD-models are missing from the pack. Either you need to limit the usage of tags to ~3 to 4 tags in the DHMP packs, or skyjake needs to adjust the UI logic to compensate for tags bleeding into the UI buttons. For example trying to select the DHMP Energy cell pack one can accidentally click the 'plasma' tag instead, it happened to me on several attempts. I still cannot see any visual difference in DOOM when activating the reflections.pack. Are there any other requirements/dependencies for the reflections.pack to work? Yep I need to make it handle long tag lists more gracefully. Although looks like some of the DHMP packs have redundant tags. @KuriKai, if a word is in the package title, it has no benefit to have it also as a tag because both have the same effect when searching. For example, the "DHMP Chaingun" package does not need the "chaingun" tag. "Polly wanna cracker?" Er, I mean, do you want me to raise a bug ticket for the tag issue? Wouldn't hurt to have it in the tracker. @skyjake now that the list of models is getting longer, is there a simple way to get it to load all the dhmp packs with one click? now that the list of models is getting longer, is there a simple way to get it to load all the dhmp packs with one click? Not via the UI, but you can use package dependencies. Basically, dependencies allow you to set up one "all-in-one" package that loads everything else via the "requires" dependency. This all-in-one package could be a subpackage under com.hiriwa.dhmp, or it could be a standalone package that just refers to the DHMP packages by their IDs. For a Snowberry Box style organization, you could have the main package be "com.hiriwa.dhmp.pack", and everything else is subpackages inside it. The metadata of "com.hiriwa.dhmp.pack" itself could then specify the required and optional packages. in the console type "rend-bloom 0"
also are you trying it on ep1/2/3 of DOOM? DOOM2 doens't have reflections yet. no other requirements are needed. I just tried it in Ultimate Doom, no other addons, no extra definitions, changed rend-bloom to 0, still no difference is visible to me. Also tried with hi-res textures to no avail. Can you post before/after screenshots showcasing the effect? Surely it shouldn't be this hard to notice? So it's supposed to affect HUD models only, not any surface (wall/floor/ceiling)? Btw, whether 'rend-bloom' is set to "0" or "1" does not affect the overall impression of the reflections that much. Actually I prefer 'rend-bloom 1' with the HUD-Chaingun. There's nothing wrong with the rotation direction, it spins counter-clockwise just like the sprite does. The HUD-Chaingun looks f-ing amazing!. But only when used together with the reflections pack. Therefore I recommend to update the hud-chaingun meta-info to declare the reflections.pack either as an requirement (must be loaded) or recommendation (should be loaded). The HUD-Rocketlauncher textures are to bright, they should be much darker towards black color, like the sprite. The additional fire exiting at the top of the nozzle is a nice idea, yet visually a bit underwhelming. I'd expect the fire to increasingly spread both in width and height during its discharge. We have quite a few entries in our pack now. I'm wondering if maybe having a drop-down menu to handle individual objects in a pack would be a good idea. Currently, you have to go through a long list of 25 items hitting the plus marker to load them. It would be nice if the DHMP had a single listing in the mod list that you had one check box to load the entire pack. To maintain granularity (people will always be arguing over shotgun models!) there would be a dropdown menu where you could untick/tick individual items in the pack. This functionality is already available in Doomsday. If a pack defines the "recommends"/"extras" dependencies, the Options popup will be available for the package and you'll have individual toggles for each of the optional packages. I have never been able to get that to work. would you able to provide a working example? EDIT: Due to PostFatal 's post I reviewed my video of the Chaingun sprites. I agree that actually your brain makes up whether the sprite rotates clockwise or counter-clockwise. If you watch the video of the chaingun sprites and decide on a spinning direction, you can actually see it. One can also reduce Doomsday's game ticks to get a similar slow down effect. I have a written a macro which is bound to keyboard function keys, but that's probably too advanced for the average user, so I won't go into details here. With the update of the HUD-Chaingun the issues and suggestions I posted here have not been addressed, and my question in that post is yet unanswered.